[prMac.com] Bangalore, India - JSplash Studios has released Piano Tuner PT1 1.0, a professional piano tuning app for macOS. Piano Tuner PT1 enables professional piano technicians to tune a piano to the highest possible standards. 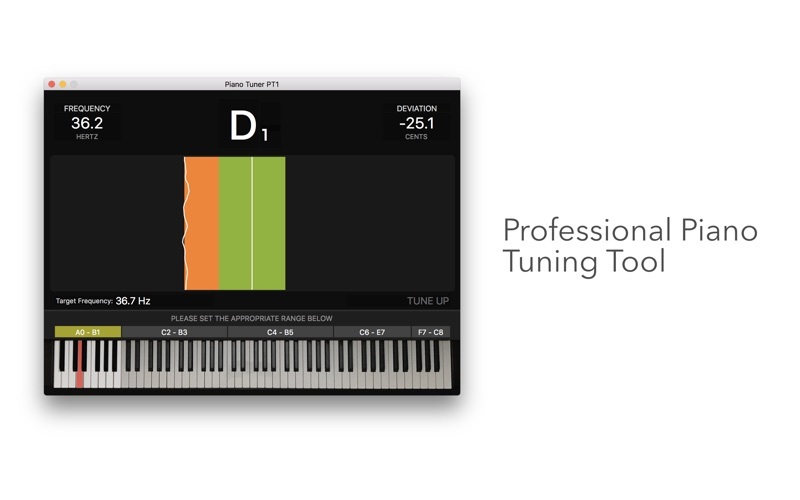 With over 10 years in development, Piano Tuner PT1 features a top-class pitch recognition algorithm that lets professional piano technicians perform high-quality tuning of the entire range of the piano (88 keys). The application shows the precise pitch frequency and deviation from the target frequency for any note. Piano Tuner PT1 also supports other tunings where A4 frequency is different from 440 Hz. Piano Tuner PT1 1.0 is $499.99 (USD) and available worldwide exclusively through the App Store in the Music and Utilities category. For more information, please contact Bijoy Thangaraj. JSplash Studios is the company behind apps for professional musicians and music learners such as Rhythm Pad, Aural Wiz and Music Tutor. All Material and Software (C) Copyright 2017 JSplash Studios Pvt. Ltd.. All Rights Reserved. Apple, the Apple logo, iPhone, iPod and iPad are registered trademarks of Apple Inc. in the U.S. and/or other countries. Other trademarks and registered trademarks may be the property of their respective owners.